Welcome, Youtube family. Tonight I want to share some things from our book Chronicles of the Bride. Actually, just one particular passage. But, before I do, I want to say that I believe in my heart that the best possible way to help you with discernment, to help all of us with discernment is to be transparent and honest with you about my faults and shortcomings and about the times when the Lord has had to reprimand or correct me. Or I was misguided and He had to change my guidance, or I was deceived and I ha to delete something. I think this is the best possible way that I can share with you what He's taught me with discernment. On March 9, 2007 I was in Heaven with the Lord. Jesus and I are on a small sailboat crossing a very large lake, headed in the direction of some steep mountains on a distant shore. I see myself as a young woman, on the bow of the sailboat. We have entered a lush cove with thick jungle, climbing steep hills on either side. The water is pristine emerald with a white sandy bottom. We are approaching a pier at the end of the cove where a small crowd of native women and children have come out excitedly to greet us. I am quite surprised because I don't know any of them, yet they seem to know me. Jesus replied to my unspoken thoughts, "You are their mother." "I am?" I replied incredulously, "But how can that be, Lord?" "Anyone who does the will of the Father, is Mother to them." After we pulled up to the pier Jesus got out first and then helped me. The children immediately surrounded Him, and then me and started putting orchids in my hair. One of the heavy set native women, walked up to me with a group of ladies and placed an exquisitely embroidered white satin scapular with golden thread embroidery and white silk French knots trimming the edges. It was just beautiful! It is executed with outstanding skill. Jesus explained, "They have made this for you because of your great love for them. Many graces dispensed on your behalf went to them. In those times when others did not respond to our labors, the graces were shed on a poor and simple people who would. There are many saints here, exceptional saints." suffer so terribly for just this one precious soul. "What can I do for you, little one?" I asked. He answered, "You've already done so much!" "Precious!" I kissed his little hand and lifted him up into my lap. Holding him, he rested his little head over my heart and I felt drawn away into a fathomless exchange of love. When I came back to myself we were departing in the sailboat. I looked back at little Pantutu who was waving and I said, "Lord, isn't there something special we can give him?" Jesus handed me a small gold chain and locket that had His picture embossed on it. Inside were two pictures, which I did not see. I tossed it to him on the shore and taking it in his little hands, he examined it carefully, then looked up with a giant grin. Jesus assured me, "My love, this is a real place in Heaven, with real souls, your very own offspring, Our offspring." At that point our sailboat began to gradually move back out of the cove. I was waving good-bye and he began running along the shore line following us. "Pantutu! Keep me in your prayers!" I said, knowing the prayers of pure souls carry much weight with the Father. "You are the reason he is here." The Lord remarked. "It is your prayers and offerings that released the graces to make his salvation possible. So many children, so many souls you don't know about, so many surprises!" I could only weep tears of thanksgiving for seeing such fruit in Heaven. I reflected later, after this experience was over; many years ago, I longed to go to Africa as a result of a vision I experienced during prayer, of women and children calling for help with their arms outstretched. They were living in squalor and so very destitute. I wanted to go to them, but as the Lord would have it, obedience kept us in the states, but I never forgot them. And it seems now that ministry that did not seem to be fruitful here in America, in some mystical way bore fruit in Africa. The Lord has promised, "My Word shall not return to Me void, it will accomplish that for which I sent it." We believe that the Lord did all the work necessary for each soul's salvation, on the cross, but someone must carry the message, and for this back up prayers, fasts and other offerings act as a catalyst to release the graces they need in the mission field. It has been our experience that when we have labored for a soul and they do not accept the grace, (wow, that's painful...) the Lord in His perfect economy of salvation, gives the grace to a soul that is ready to accept it, so that even those who are far removed from the mission field, by their offerings assist those who are out there laboring. That's the end of the story from Chronicles of the Bride, a very short story. Now, I want to go on to the message that I have with that as a background, so you understand what I'm talking about in this message and what the Lord is referring to. 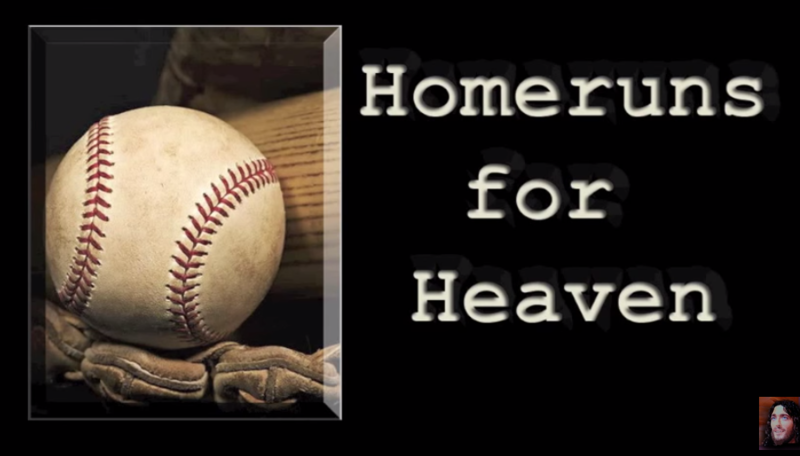 It's entitled, "Home Runs for Heaven." The Lord began: "Why have you doubted My love for you? I'm always right here with you. There are seasons where I must withdraw, for both your spiritual health and the graces given to other souls." Here, He was referring to my ability to perceive Him. "That changes nothing about the substance of My love for you. My ever-present Love is with you and for you. I never abandon you - never! It's merely an illusion created by your own mind, under the influence of the enemy. Yes - reason in your own mind. It is true that I have come to you when I was not happy with you, to help you overcome your faults and impart instruction, love and encouragement to you. So, you see, My presence is not dependent on your favor. It is My love that visits you, and My love that abstains from visiting you in a sentient way. I am with you. Period. Always and forever. You reach out to Me and I am there. Whether I respond in a sentient way or not - I do respond. How could a mother NOT respond to the cry of her infant? Just so, I respond to you with the appropriate Graces. You may or may not realize HOW I am responding, but I am. "In the meantime, sentient Graces are flowing in abundance in Africa and around the world. So, you see? Nothing is lost. Not one suffering on My behalf is lost. All is used and well distributed to the very fertile ground that is ready to receive the seed. "You see, I am like the very wise banker who takes your investment and brings forth a hundred-fold for the Kingdom of God. You, for your part, have given Me your suffering to be used without any conditions, and I, for My part, invest it where it will produce the most fruit. How can you lose? Understand this, dear daughter. Although I know your fleshly mind is severely impairing you from comprehending it - when I seem the furthest away, I am scoring many homeruns for the Kingdom of God. Though these games and their scores are hidden from you, someday you will see just how effective every severe test of faith was for the conversion of souls. I'll go into this a lot more - I think I do in some of the earlier teachings. The economy of suffering and how the Lord releases Graces when we fast and pray and offer Him whatever happens to come up in our life. There is tremendous merit in shouldering your cross without complaining and offering it to the Lord. So, God bless you Youtube family, and I hope again that these messages are blessing you. I appreciate you tuning in to our channel - thank you. The Lord bless you with very sharpt discernment and deep understanding of yourself in the Lord. Amen.